Hey there! Its finally April! I'm so excited because I love spring (almost as much as I love October - almost:)) Spring brings warmer weather, playing in the backyard with my kiddos, warmer weather, nighttime fires around the fire pit, did I mention warmer weather?!? It is also the beginning of t-ball season, so we will be spending a lot of time at the field for the next 3 months (my son plays and my hubby coaches!). Now, its time for some currently! Right now, I'm washing dishes, laundry and listening to Uncle Grandpa (one of my son's favorite shows). Spring Break begins today (technically yesterday, but I was at a training all day). 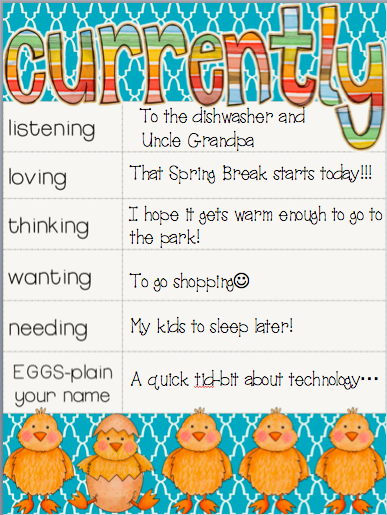 Since its Spring Break (and we aren't going anywhere), I want to do some fun stuff with the kiddos. It should be warm this afternoon (67º), so that's the plan. I also want to do some spring shopping at Once Upon a Child and Homegoods, scrapbook a few pages, and maybe make a new TPT product. My son woke up at 5:30 this morning! Seriously, is somebody supposed to sleep in on Spring Break with kids getting up that early? 7:00 is early enough (when they usually wake up), but 5:30?!? Teachers don't have a lot of time, but most of them are willing to learn something new - especially if it is quick. I created this blog to give teachers ideas of how to use technology in a quick and dirty sort of way. That's why I named it Technology Timeout - take a quick timeout to learn something new about technology. Now, I'm off to see what everyone else is up to! My son always wakes up the first in our house too! The girls love to sleep in! Hope you enjoy your spring break! My son is always up early no matter the day of the week. My daughter on the other hand would sleep until noon if I let her. Sounds like you have a great day planned with some nice weather and fun activities with your son. Enjoy your spring break! I wish our district had a technology coordinator. I'm sure that you have a lot of great things to share. I'm your newest follower. Heading on over to follow you on Bloglovin. I can always use some tech tips. I am with you on the shopping I can not wait to get some new things for Spring. This is great starting of April first week, I also love spring,, thanks for your interesting post.. I just found you on Currently. Enjoy your break.